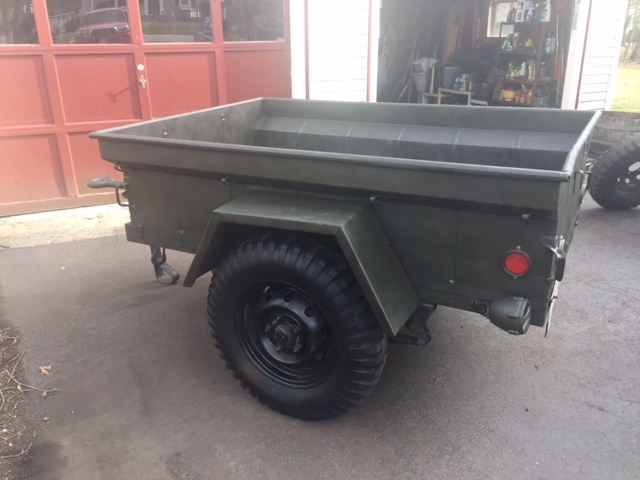 I have picked up another M416 Trailer for restoration. This unit came from GSA and a Fire Department on Cape Cod, Mass. It is a very good trailer that has been storied inside during most of it's use. There are no rust through any where except on the upper section of the box. They drilled holes to mount something that rusted and now needs to be welded closed. All of the parts are there and the only thing I need to due is replace the Data Plate and install a new brake cable. I will be sanding the body and underneath. I will be applying a primer and then a correct OD top coat. I will be installing new numbers and then offering it for sale. I plan right now to ask $1600 to %1800 When it is on the market. Each Trailer that I refresh has sold for $1100 to $1250 depending on tires and hitch. This has very good tires and the correct hitch. I will update this site as I go along. This is how it should look like when close to being done. I am doing some work at the local Vo=tech on the trailer. I have sanded the sides and welded up the holes in the sides. I now need to grind down the welds and smooth them out. There are only two drilled holes in the floor to fill in. I need to replace one of the tail lights so the pair will match. I am leaning towards new style lights for more safety. Any one have an inexpensive brake cable that I can buy? Your making that much profit on the trailers just get the right cables! just to be clear, I will use the proper cable for the trailer. I am looking for the best price and if some one who is on the site, that would be great. I will be reaching out to the vendors listed on the resource page as well. 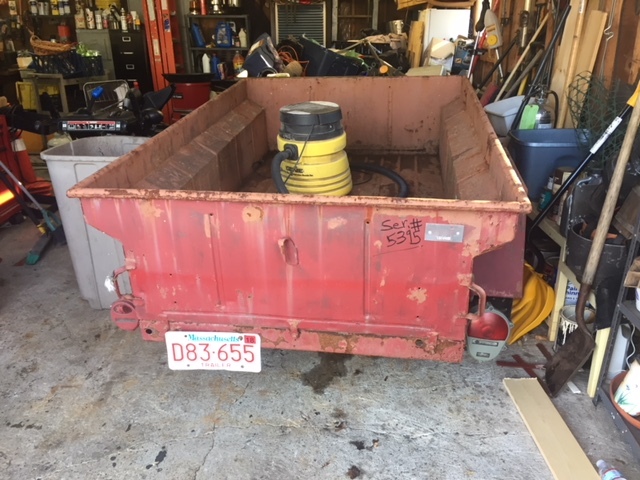 I am now retired so while labor is now free, the "profit" from selling the trailer is my only free cash to use on the hobby. 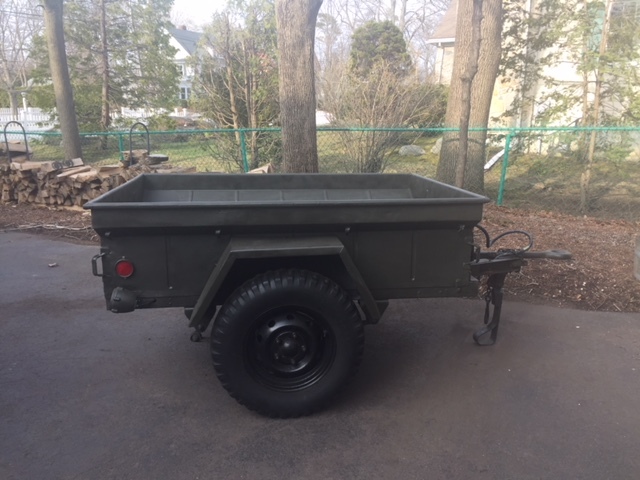 I have just purchased the M151 listed under Rusty Traveler. I use my jeep as shown in the latest issue of Army Motors and the Great Smoky Mountain Convoy. Body has been cleaned, sanded, and prime coated. Rust reformer has been applied to floor after grinding and sanding. I have received new wire harness for lights. I have ordered new brake cable and clamps. Temperature is forecast to be 70 degrees on Wednesday so OD coat is scheduled. Fenders were removed for sanding and I found undercoating inside fender wells. New hardware used to attach fender to body. Looks like a nice trailer, a coat of OD and she will look sweet. I had 6 inches of snow Saturday night. It is all gone today. Forcast was for 60 degrees but my thermometer reads 72 today. So what do you do on such a fine day. 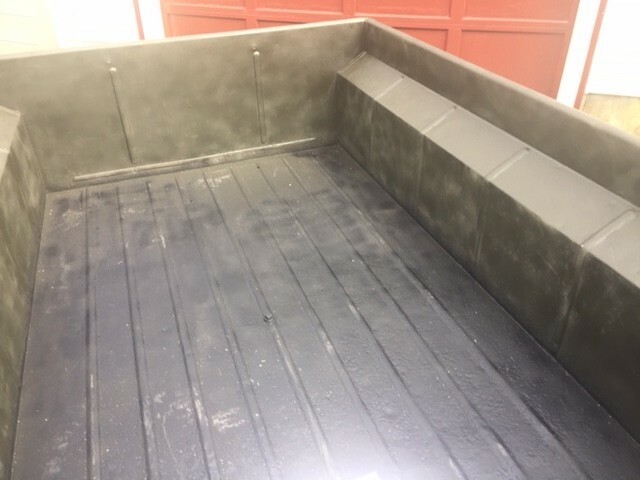 Paint the trailer. First coat today. Forecast for Wednesday is even hotter. Snow is now forecast for Thursday night. Installed new trailer wiring under the trailer. 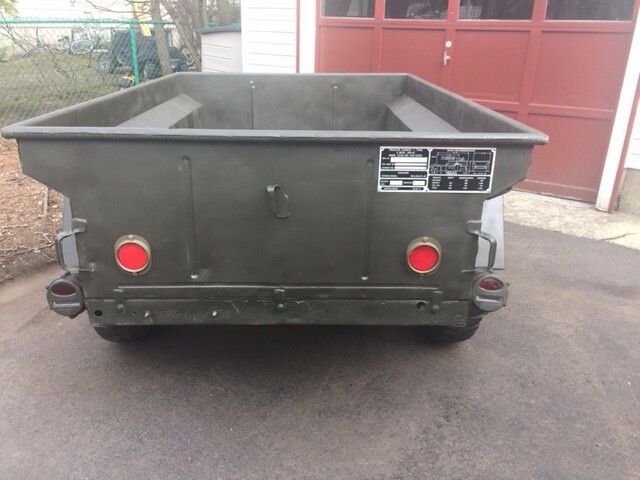 Found out previous owner((US forest service) cut the wires on the tail lights to the blackout parts. I will have two left side lights as the trailer will be used on the public roads and I want full tail and stop lights on both sides. Went to test fit to my jeep and found that the brake (Stop)light pin is being pushed into the connector. So I ordered a NOS trailer connector cable. I also installed a new hand brake cable with new hardware. 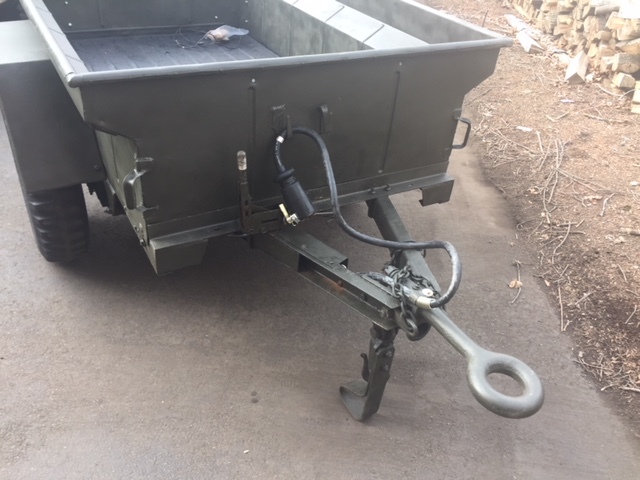 It can be adjusted properly and holds the trailer well. Painted inside and out with fresh paint. Looks great. I might recommend using the taillight lenses or assemblies from a M561 Gama Goat, as these are full-size lenses and mount the same as the originals. We replaced all of our trailer lights in my Army company with the Goat lenses and they greatly improved the STOP message beaming out to those behind us on the roads. Scheduled for delivery to new owner tomorrow morning. I installed new connection cable on trailer. I used a M100 cable as it was a lot less expensive. $45 vs $140. Only two differences from the M416 cable. The right side cable is terminated without a end as the M100 did not have Full stop/tail light on right side. Cut off and installed proper connector. Other issue; the Packard connection vs rubber. The connector insides still fit and work well. They are shielded behind a cover plate upfront and are sealed with shrink wrap tape.The M100 part was in a cardboard box sealed in a plastic bag with a date of 1967. Same age as the trailer. When i plugged in the connector to my M151(early edition), the right side tail/stop light did not work. I determined that the trailer connection on the jeep had no power to the plug. I am all set for delivery tomorrow. It also comes with a spare tire mounted on wheel. New owner can install Gama Goat lens if he desires. I agree they work better, I have them installed on my own M151. The After Pictures in my drive way.